Located just west of Iowa City, Coralville, Iowa is ready for you. The ever-growing city nurtures businesses old and new, making it one of the most appealing locations in the Corridor to open or grow a business. 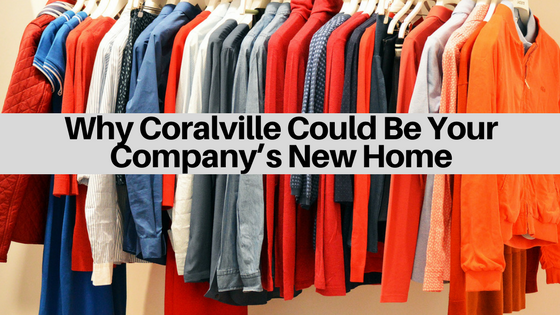 Here’s what you can expect if you choose Coralville as your base of operations. Prime real estate: Coralville’s Iowa River Landing is steadily becoming a valuable location for business. A branch of the University of Iowa Hospitals and Clinics and a large Marriott hotel mean a constant flow of people, and a growing number of shops and restaurants are quickly filling in the 180-acre district. The recent opening of the area’s only Trader Joe’s grocery store brings in shoppers from surrounding cities. Apartment, condo and townhouse units are also springing up in the Iowa River Landing, which means that even businesses that don’t necessarily rely on tourism can still thrive there. The easiest access: With two exits from Interstate 80 (one that exits near the mall and the other near the Iowa River Landing), Coralville is extremely easy to get to. This is a bonus not just for commuting employees, but also for shipping and business travel. The city is just a short jog down Interstate 380 from the Eastern Iowa Airport in Cedar Rapids and is even closer to Iowa City’s municipal airport, so air travel is well within reach. Valuable partnerships: Business development for the entire area (including Iowa City, Coralville and North Liberty) is covered by the Iowa City Area Chamber of Commerce and the Iowa City Area Development Group, and the local CVB recruits visitors for all three towns as well. Combining efforts like this benefits all of the communities involved by leveraging the unique strengths of each one and avoids the inefficiency of maintaining three separate organizations. Resources: Consider the Chamber of Commerce and the local development group to be extra members of your team. The Chamber can help drive extra traffic to your establishment by listing you in the guide to local businesses. The Iowa City Area Development Group is ready to nurture not only your business but you as an entrepreneur. Find the perfect location with their database of sites and buildings, then check out their labor and demographic information to recruit the right employees. Entrepreneurial development programming and assistance with economic development incentives will help set you up for success. Knowledge workers: The Creative Corridor, which includes Coralville, has a population of more than 458,000 and a labor footprint over 640,000. Because the Coralville-Iowa City area is right in the middle of the largest population region in the state, people drive from a 60-mile radius to work – and that means you get to have your pick of the area’s best and brightest in your field. Companies thrive in the Coralville-Iowa City area in part because the area’s affordability and diversity of opportunities attract the kind of skilled, productive workers that can power innovation for your company.